Review posted March 28, 2018. Simon & Schuster, 2017. 271 pages. The written word and the world of numbers should not be kept apart. It's possible to be a lover of both. Through the union of writing and math there is so much to learn about the books we love and the writers we admire. And by looking at the patterns, we can appreciate that beautiful moment where the pattern breaks, and where a brilliant new idea bursts into the world. Anyone who reads that paragraph and knows anything about me will understand that I loved this book. It's a big data approach to literature, a statistical look at good books. Seriously, what the author did here was take a huge amount of digitized texts from the classics (award-winning books or books on "best" lists) and from bestsellers and (for comparison) from fan fiction. Then he ran the numbers, asking a wide variety of questions. And discovered some fascinating things. Do great writers actually use fewer -ly adverbs? Can you tell the difference between books written by women and books written by men simply by the words used? Can you figure out who really wrote a book, the big-name author or the coauthor? Do people follow their own advice (such as leaving out exclamation points and getting rid of "very")? Are bestsellers getting dumber? Do Americans write "louder" fiction than British writers? Who uses the most cliches? 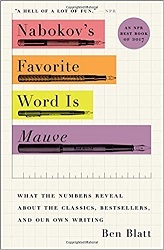 And the one hinted at in the title: What are a writer's favorite words? You can probably learn something about what makes good writing from these insights, but mostly they're just a lot of fun to think about. Who knew, for example, that Danielle Steel has begun 46% of her books with a sentence that refers to the weather? Or that Neil Gaiman's favorite word is "unimpressed"? But that wouldn'wwwt have made as good a title.